A Website Development has many stages wherein PSD to HTML5 Conversion is one of the important and most demanding stages of the development process. A user-friendly website, video element and SEO-Friendly are some of the features that you will come across with this conversion. A website development has many stages, wherein converting design files to HTML codes is one of the major stages that makes way for a successful website. When it comes to converting the design to HTML codes there are yet many options to be considered. Talking about the conversion, PSD to responsive HTML5 conversion has been trending off lately. Hyper Text Markup Language, that's what HTML stands for, is one of the well known programming languages used for website development. With many new updates and advancements taking place in the world of technology, HTML too has its updated version being extensively used by the developers. The responsive HTML5 is trending the world of web development with many new and authentic features. Talking about features, let me walk you through some of the interesting reasons that will compel you to choose the PSD to responsive HTML5 conversion technique for your next development process. 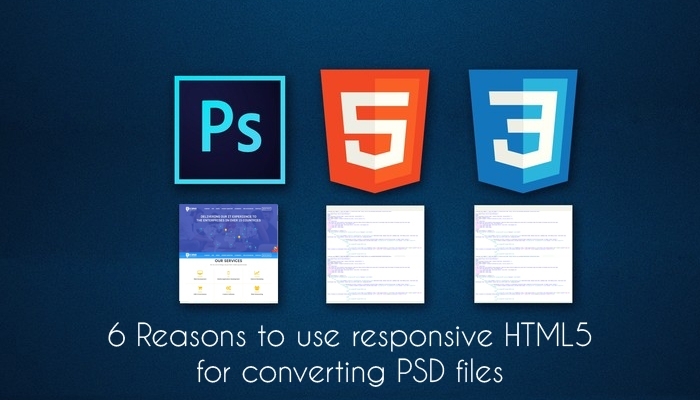 Here are a few prominent reasons that define the need for a good PSD to responsive HTML5 conversion process. Read on to find out. In the present era, almost all the browsers out there support HTML5 tags. This will ultimately give you web solutions that are accessible across all the browsers. All your web pages will be efficiently rendered by the browsers, giving you a cross-browser compatible web solution. Moroever, this will extend your reach and audience. Apart from cross-browser compatibility, you will also be welcomed by web solutions that are all smeared with clean markup and clean code. This makes the web solution widely accessible across the world wide web. You can very well replace all the div tags with the new HTML5 elements for clean and clear markup codes. With responsive HTML5 codes, you get to lay your hands on web solutions that could be easy crawled by the Google Crawlers. As the codes are all semantic in nature you will be assured of an SEO-friendly web solution. This consequently improves the structure and readability of the website. In addition to these, you will come across fast loading web pages, contributing to your website's authenticity. HTML5 now has a video support making it easy to access quality video content available on the digital platform. This native video support allows easy access to high-quality video content to the supporting browsers. A positive impact on the SEO could be witnessed with this new HTML5 feature. There are many factors that contribute to a great user experience. Improved accessibility, a unique form of consistency and fast loading web pages are some of the factors that enable a great user experience. When you opt for the PSD to responsive HTML5 conversion service you will be entitled to a website that has a great user experience. Mobile-friendly websites are gaining popularity due to a large number of people making use of their smartphones to access the internet. Moreover, when you have a mobile-friendly website you make way for a larger set of audience to grow and develop your business. With this conversion process, you can make your websites respond to the devices that it is being accessed on; widening your user visibility. Above-mentioned are some of the reasons that very well proclaims the significance of a responsive HTML5 conversion for your PSD files. Having said this, you will always be welcomed by credible and authentic results if you choose this path of HTML5 conversion. This Hypertext Markup Language is loaded with all the necessary features that will yield you with web solutions that are par excellence. So, what are you waiting for? Go ahead and choose the responsive HTML5 technique to design your website for efficiency. Hiren Hirpara is a senior SEO Executive working at Techno Infonet. 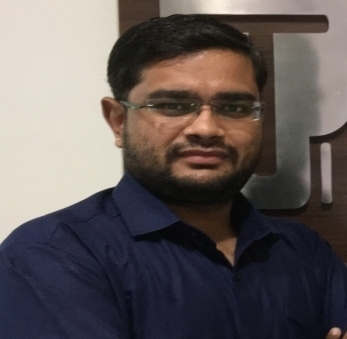 He has more than 5 years of impressive professional journey in SEO, a masters degree in Computer Application, Certifications in Google Analytics and organic SEO.